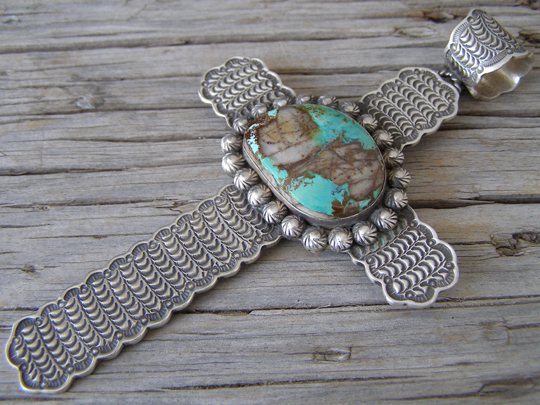 This large cross pendant by Matthew Charley is set with a big free-form stone of natural, untreated Royston turquoise. The stone is set in a smooth bezel and surrounded by stamped swirling starred buttons. Matthew is know for the exacting fish scale stampwork which creates beautiful texture on this cross. His perfectly round bale is made from the same weight of silver as the pendant and has a creation spiral stamped on the top of the bale. The bale of this pendant will accomodate 10 mm. diameter beads. This is a stunning piece with a superb stone. Stone: 1 1/8" x 7/8"
Dimensions of cross (excluding bale & jump ring): 4" x 2 3/4"